Join Middle Fork Wilderness Outfitters on America’s premier wilderness river. The Middle Fork of the Salmon River runs through the Frank Church Wilderness Area, the largest protected wilderness area in the continental US, and is considered to be one of the legendary multi-day whitewater rafting trips in the world. 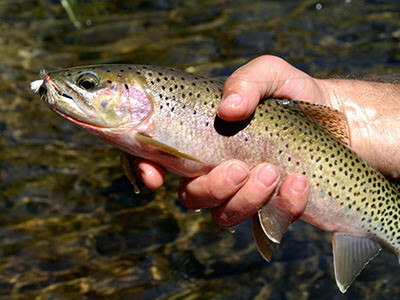 Fishing for Westslope Cutthroat Trout in this blue ribbon fishery is unparalled, giving dry fly fisherman the thrill of seeing trout strike in the crystal clear waters of the Middle Fork. The summer fishing season is primarily during July and August, while September and October offer a whole different experience with our smaller groups. All fishing on the Middle Fork is catch and release with single, barbless hooks. This policy enacted in 1973 has allowed the native trout population to thrive in this world famous watershed. Whether you’re a seasoned fly fisherman or just beginning to explore a new passion, our professional fishing guides will make sure you are on the fish. So whether you’re just in it for the 100 miles of rapids or looking for world class fly fishing, a trip on the Middle Fork with Middle Fork Wilderness Outfitters is the ultimate wilderness experience. There is still time to book your trip for the 2019 season. Check out our dates and rates, then contact us for help in planning an adventure you will never forget. Middle Fork Wilderness Outfitters – Adventure Awaits! For a trip of a lifetime, Contact us today!